Making a Tedious Task Fun! When I was trying to think of a title for today’s video, I was trying to figure out what it was about and the why behind what were doing. We make daily videos on YT sharing what we are doing for the day on the homestead. Today was a tedious project. We have been busy building the Off Grid Outdoor Kitchen and we have been neglecting a few things around our homestead. 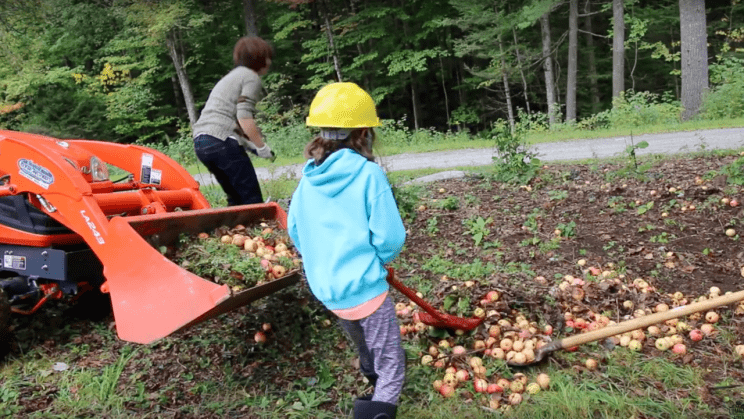 One of them is picking up apples that have fallen from the trees, and there are a lot of them. I haven’t mowed because there were too many apples on the ground and I didn’t want to take the time and pick up them up before I mowed. You know what happens when you mow apples? you get Apple Sauce :). We tried to get Olivia help pick up some but to a 9-year old that is not a fun. Heck to a 36 year old looking at all those apples can get overwhelming. Now that the kitchen is finished on the outside we had time to clean up the apples and mow. But how do you make a tedious, very overwhelming task fun or at least bearable? That was the question I asked myself. We are doing a lot of work restoring the land here at Lumnah Acres and I would love for Olivia to want to take it over and grow it even more. But I fear if we force her to do a task that makes her and us miserable she won’t want too. I mean if it was the other way around I would grow-up hating it too. I don’t want to raise a child that is a spoiled brat that gets whatever they want. But I also don’t want Olivia to grow up and hate homesteading or farming. It can seem like a fine line sometimes. We don’t need to raise another generation that doesn’t want to do what their parents did. Getting back to how do you make a tedious task fun? For me, it’s getting the whole family involved is what makes it fun. 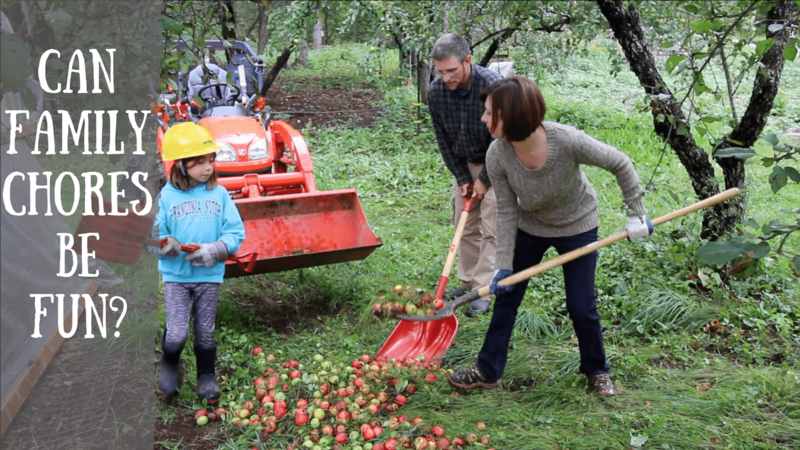 We took a task that looked very overwhelming and turned it into a time for the whole family to work together and spend some quality time enjoying the nice fall weather. At the end of the day, we sat back and saw what we had accomplished together and still had time to run errands and get together with some friends for dinner. It was a pretty great day in my book! Now every time we hear an apple fall, we can smile and laugh with each other saying no… Not Another One! Want to find out how we make family chores fun? Click to find out! I absolutely loved this article. I’d noticed that both Olivia and Gina weren’t overly keen about the task initially but your innate ability to be enthusiastic about homestead tasks, even if they’re not overly pleasant, spurred them into action. As a family team working together the task did indeed seem to become more fun once you were engaged in it, to the point where Olivia was joking about and claiming independence for the rock. There is great wisdom in the way you consider and walk that fine line of teaching Olivia to love homesteading, without it being forced. The popular biblical tale speaks of us gaining knowledge and wisdom via picking the apple from the tree and in this task you seem to display it via picking them up from the ground, in your own special piece of Eden! 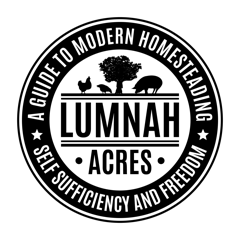 You’re a excellent homesteader but more than that you also appear to be a great leader, partner and parent within your family, and that’s pretty special. None of us were looking forward to the task. 🙂 But I especially liked the look Gina and Olivia gave in the opening of the video. I didn’t realize that till I was editing the video. And at that point, I figured we needed to tell some more of the story. With the videos, you only get so much. I’m in the same predicament – been canning peaches and tomatoes like crazy, freezing zucchini, peaches, kale, broccoli, cauliflower & green beans with a vengeance, drying zucchini, peaches & tomatoes till I run out of flat surface. Today I made cheese and went outside to breathe a bit and noticed since putting winter food up, how lazy I had become at putting things away outside! So yep, I’m with y’all! Got to get on it because I plan to butcher turkeys real soon! Once those are out of the way, time to butcher goats. Sometimes to my benefit, being in an alpine desert, I have no grass this time of year. Well this year was strange and I lost all my grass by the end of June. My last snow fall was June 14 and on the 18 it was 100 degrees, instant summer and everything was gone by the end of June. My chickens and turkeys were so desperate for greens, they ate all my onions and garlic, decimated my greens and took out my cucumbers! But I have grass envy seeing all your grass! Wild fires have brought out the bobcats & mountain lions so my turkeys and chickens had to go back to their winter housing area for safety – they aren’t happy about that arrangement! Yeah, the work is never ending but I wouldn’t exchange it for any other life!! I hope your grass starts growing soon. It is crazy how fast your summer comes! I loved watching you work as a family making a tedious chore fun. What a lot of apples. My kids have chores, then they have extra duties. They hurry trough their chores or get Momma to do them, so they can get back to their tablets. For extra duties I usually try to challenge them with something like take that pile of bricks and make a circles around the willow trees we planted. 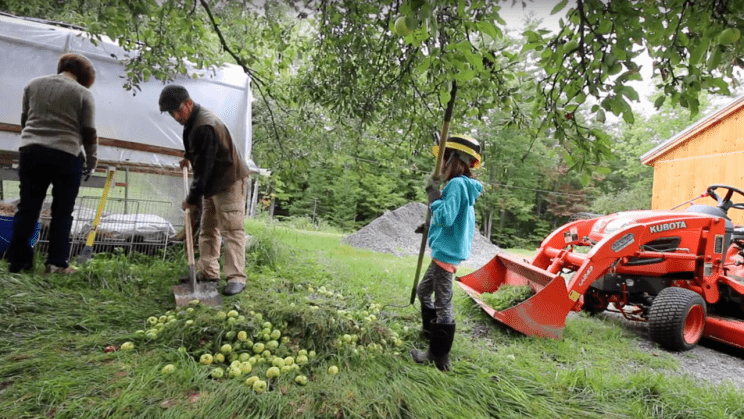 Everyone that lives under your roof and consumes the blessings of a homestead has to contribute, to make things function, I wish my kids did more, and shared some interest in producing food. They have chores and extra duties but they hurry trough them to get back to their tablets. When my children lived here, it was a family effort but they’ve all grown up, married and are building their own homesteads. I’m here doing it by myself. Been living this way my whole life and enjoy every moment. I have no need to grocery shop and when I need something I can’t grow, I barter. I just bartered a turkey for some – hopefully – elk or venison, zucchini bread for lemons to make peach jams which I bartered for some raw cream to make butter for the next 12 months, fingers crossed. I grow wheat and grind my own flour and corn for cornmeal. I will head into town before winter snows hit and stock up on sugars, oils and leavening items and I did buy lots of honey from a local grower which I will use in several things – creamed honey is always a big hit! – to barter out later or gift giving. So yes, get your children involved while you can because they won’t be with you forever. We parents only have a small window to teach them to live well.